As always, the league has made a number of rule changes for the upcoming season. One affects the playoff format, and that’s kind of a big deal. The rest of the changes to the rule book are either not rule changes at all (just clarifications) or are very minor changes that nobody is ever likely to notice. Last season, when the league released their list of changes, they released a document that contained just the changes, and they also released the entire rule book with the changes in bold text. This year, they just released the new rule book. All 134 pages of it. There was no guidance on how to find the changes (some changes were in bold, but not all), so I went through the 2018 and 2017 rule books and compared them page by page and paragraph by paragraph. This is the kind of dedication you’ll find here at NLL Chatter; I do the hard work because of my passion for giving you, dear reader, the information and analysis you demand and expect. Plus, Criminal Minds was a repeat this week. The big change to the playoff format (though this has been known for a while) is that the second round is back to single-game elimination format (“one-and-done”). The other rounds did not change this year, so the first and second rounds are a single game, and the finals is a best-of-three. This means that the best-of-two series is no more, and so we say goodbye to the ten-minute mini-game, a.k.a. tie-breaker game. Farewell, mini-game, we barely knew ye – the mini-game was a thing from 2014-2017, and only five ever happened (3 in 2014, 2 in 2015). It wasn’t well liked. The sentence “The challenge flag must be initiated by the Head Coach prior to the next faceoff” has been removed but the 25 second time limit remains. There’s another rule saying that faceoffs should be done within 25 seconds of a goal being scored anyway. The sentence “Player numbers on each shoulder/bicep are required” has been removed. A little odd, since it was just added last year. The sentence “Only the current seasons’ League mandated equipment can be used. No other previous seasons’ equipment is permissible, with the exception of a helmet, throat protector, and stick.” has been removed. If penalties are given to both teams, the team that got fewer penalty minutes given will get possession of the ball. If the penalty minutes are the same, the old rule said that the ball goes to the team that has possession at the time of the first infraction. Now, it goes to the team that “did not foul last”. If the penalties were simultaneous, the team that had possession at the time of the whistle gets it, or there’s a faceoff if the ball was loose. If you’re given two match penalties or “Dangerous Contact to the Head” penalties within two years, the old rule said you “shall be assessed a five game suspension“. Now it says “an additional five game suspension“. This is just clarifying that the five games is in addition to any other penalties or suspensions you get for the match penalty itself. Update: Evan Schemenauer reminded me that Greg Harnett’s 6-game suspension last season was reduced to 5 games because of the ambiguity of this rule. When a player gets a gross misconduct penalty, he is tossed from the game. In 2018, the in-home player must also serve a five minute match penalty. Note that THREE goals need to be scored to get you out early for a match penalty compared to two for a major (this is not a new rule). Also, “racial taunts and/or slurs” (one of the things that will get you a gross misconduct penalty) is replaced by “racial, gender, religious, sexual orientation taunts and/or slurs”. If you throw your stick at someone with a breakaway, they get a penalty shot. This was added to the text of this rule: “Further interpretation is as follows: the breakaway shall be in a traditional ‘north-south’ direction with initial separation between attacker and defender, incorporating the origin from inside two imaginary lines from the goal posts to where the closest restraining line meets the dasher boards.” That text was added to many other rules regarding breakaways as well (fouled from behind, intentional displacement of the goal on a breakaway, etc.). It was already in the old rule book but only for one rule (54.5 – Throwing stick or object at ball or ball carrier when opposing goalie has been removed). The rule wasn’t changed, but a specific example was added: if a player is trying to hold the ball by lying on it, putting his foot on it, or holding it against his body, the other team gets possession. This is referring to when a goal does not count. The wording added was “The specific point of reference is the officials’ sounding of the whistle in determination of the precise point in stopping play” which doesn’t really clarify things. I think the idea is that if the ref blew his whistle in response to something and a goal is scored around the same time, the goal counts if it happened before the whistle itself, not before the something the whistle was in response to. I have a feeling this change was in direct response to an incident from last season when there was a question regarding the timing of the whistle vs. the timing of the actual penalty vs. the timing of the goal. I don’t remember the details but I have a feeling it involved the Stealth. Please leave a comment if you know what happened. 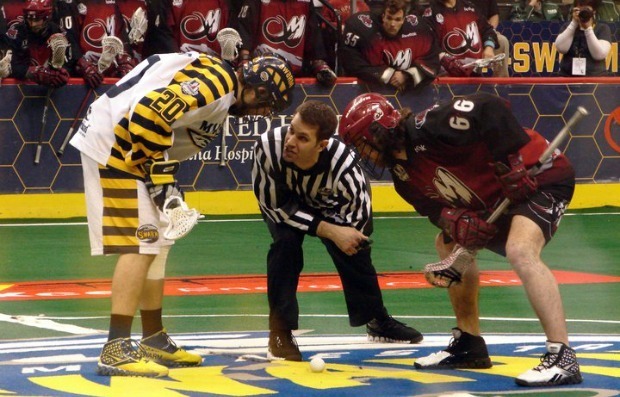 If you are in the crease when your teammate shoots, you have to get out before the ball crosses the line. The clarification here is that your foot must “entirely make contact on the turf outside the crease” before the ball goes in. If you were lying in the crease, you must not have any part of your body in the crease when the ball goes in (though the wording of this part of the rule is confusing – it says “If you are lying in the crease, then you must not be in the crease for the goal to count”). The way I read it, it means that jumping out of the crease isn’t good enough if you don’t land before the ball goes in. I think this situation came up last season as well. Update: A New England goal was disallowed in Saskatchewan because someone in the crease didn’t quite get out in time. The penalty says that there is an onus on a player not to put himself into a dangerous position. This wording is rather vague, and so this was added: “This player is still permitted to carry out normal lacrosse plays, such as trying to dodge away from the opponent or make a move as a means to decrease the severity of the incoming contact.” To me, this doesn’t clarify anything. Was there a question as to whether a player was “permitted to carry out normal lacrosse plays”? Elbowing now includes use of the forearm, bicep, or shoulder. I guess they decided against adding a new penalty called “shouldering” because it sounds dumb. It also includes the text “that makes contact above or below the shoulders” which, I think, just means that you don’t have to hit someone in the head for this penalty to be called. The goalie is allowed to continue playing with a broken stick until the next stoppage of play, but as of now, he can only do this within his crease. Update: I missed this change the first time around. Thanks @SaskRushFans! Also expanded to include comments on sexual orientation and gender identity in addition to race and religion. Much of this rule has been rearranged rather than rewritten. The “spirit” of the rule remains the same but it’s been cleaned up. Basically, once an “altercation” has begun and play is stopped, players on the bench must stay there until the altercation is over and the penalized players are heading to the penalty box. A related change to rule 96.1 says that if you leave the bench during an altercation, you get a bench minor penalty.